Social creatures, such as honey bees and humans, employ elaborate methods of communication. The honey bee evolved senses and behaviors to help protect the colony from hazards in the environment and to allow the bees to effectively forage for food over great distances. Most of the colony’s communication senses are based upon pheromones, odors that the bees recognize. Other methods of communications involve vibrations, usually detected as movements in the honeycomb of the colony’s hive. These behaviors are used to defend the colony from intruders, protect it from disease, and notify the members of available food sources. We observe the actions of guard bees instantly alerting other worker bees while defending against an intruder attempting to enter the hive. Scout bees convey newly located nectar sources to forager bees by demonstrating with dances and sharing a taste of the nectar. Humans communicate largely by visual signs, electronic devices, and speech, a form of controlled vibrations. While the craft of beekeeping developed over the years with most of its great innovations developing in the mid-1800s, the science of honey bee biology is being advanced today. The 2006 completion of the honey bee genome project greatly broadened the study of bee disease mechanisms. Human communications, especially via the internet, now allow researchers anywhere in the world to work together and share knowledge. Our ability to communicate will help us solve honey bee problems that we may have created ourselves through the importation of pests, parasites, and pathogens as well as our use of chemicals in bee hives and the environment. I watched an example of mankind’s cooperative efforts in communications and problem solving as the International Space Station made a six-minute pass over Peace Farm at 17 thousand miles per hour. 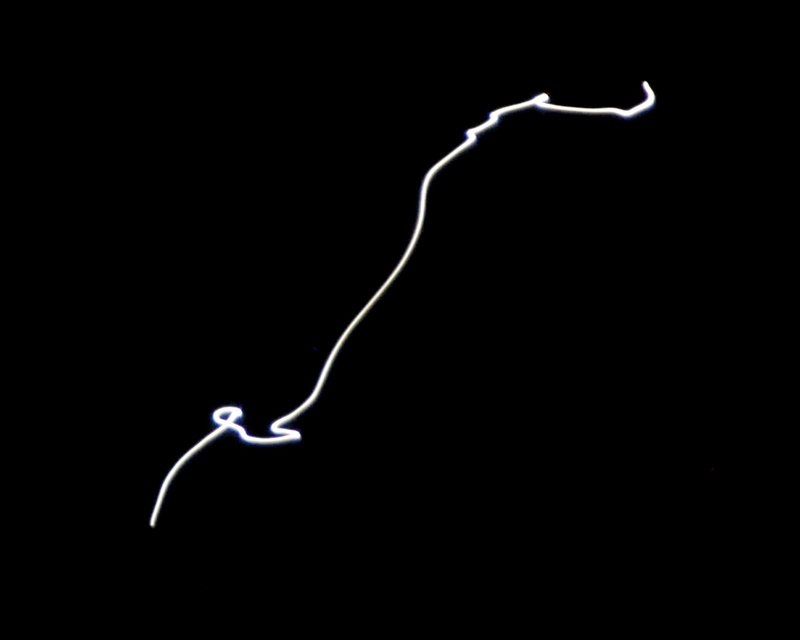 The manned space station appears as a bright, moving star. That’s my camera’s wobble, not the space craft. 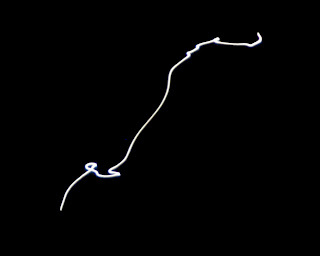 You may follow orbital tracking at http://spaceflight.nasa.gov/realdata/tracking/, and you may find when the space craft is passing over your location at http://spaceflight.nasa.gov/realdata/sightings/. A hot, dry summer is often the backdrop for a good honey production year. This year’s wet, stormy spring kept farmers out of the fields in the Arkansas Delta. Planting was delayed, but a healthy crop of cotton and soybeans followed. These crops account for an abundance of Delta honey. Honey bees gather significant amounts of nectar to make a surplus of honey in strong hives. A surplus of honey can only be produced if the colony is strong and productive, the hive is near a good source of nectar, and the queen is producing large numbers of eggs in the weeks prior to the major nectar flow. 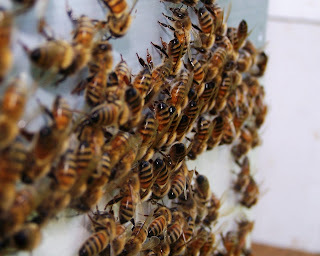 The timing of the colony’s population build-up is critical for honey production. If the colony is just starting to expand during the nectar flow, there will probably not be enough of the older worker bees, the foragers, to gather enough nectar to make a surplus of honey. I tested using additional entrances to my stronger hives this year. The entrances are placed between surplus honey supers at the top of the hives. There is evidence that the entrances allow foragers to deliver their nectar more efficiently. 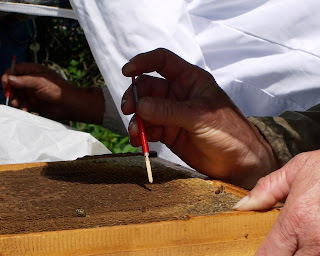 Nectar is taken directly into the honey supers without having to be carried through the brood nest. Upper entrances also allow for extra ventilation at the top of the hive. However, the wooden shims used for the upper entrances violate the concept of bee space. Every opening inside a bee hive should be three eights of an inch. The shim’s wider gap between supers makes a space that the bees fill with honeycomb. In fact, many of the hives equipped with upper entrances became clogged with burr comb in the space between supers. Burr comb, which is any honeycomb that the bees build that does not conform to the shape and order of the hive’s removable frames, tends to break when the hive is opened for inspection or honey harvesting. Today’s picture: burr comb, a sticky mess. Can we see evolution in action? The New York Times reports that a group of evolutionary biologists and geneticists from Harvard University is attempting to find the mechanisms that lead to physical changes and learn how those changes affect fitness. They also want to learn how changes make an organism likely to survive and reproduce. These are critical issues for honey bee health. Harvard’s Dr. Hopi Hoekstra explains, “Fitness is the most important concept in biology, but no one ever measures it.” To observe evolution while it occurs, the researchers devised a test of fitness. They built four large enclosures on light-colored, sandy soil to house deer mice. A distance away, they built another four similar enclosures on dark-colored soil. Some of the deer mice, North America’s most populous mammal, have lighter colored fur than typical deer mice. The researchers discovered that the range of colors is dependent upon a single gene that controls pigment-producing cells. Mutations in this gene lead to deer mice with various levels of fur color. Mice that differ greatly in color from their background are easily spotted by predators, quickly changing the population of highly visible mice. The researchers are measuring the fur color shift in deer mice populations. The deer mice study can be viewed at http://www.nytimes.com/2011/08/09/science/09mouse.html. While people often think of evolution as an extremely gradual process, at times rapid changes occur. This is seen with pathogens becoming antibiotic resistant and honey bee parasitic mites quickly becoming resistant to chemical treatments. Hopefully, we will start seeing honey bee populations evolve that are fit to live in our rapidly changing environment. European honey bees have been in the presence of parasitic Varroa mites for about 150 years. In this time some resistant lines of honey bees survived, and their offspring are now being selected by breeders. Today’s photo shows tickseed coreopsis, a colorful summertime carpet along roadsides and clearings. 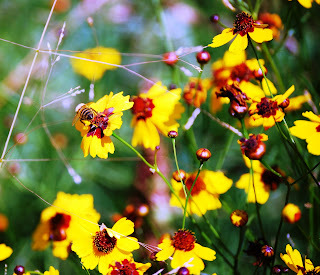 Coreopsis is a member of the important family of bee plants, the composites, or sunflowers. Beekeepers know it is common for bees in different bee yards to have distinct natures. The bees in one yard may be more defensive in behavior than the bees in other yards managed by the same beekeeper. 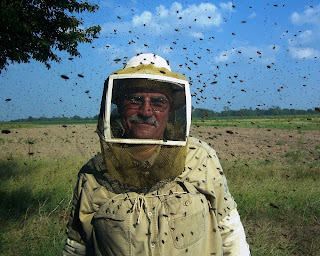 Also, certain beekeepers gain a reputation for keeping “hot” hives, while other beekeepers keep gentle bees. What causes bees to be defensive? Is it the location of the hives, the way the bees are manipulated, the bees’ genetics, the beekeeper, or bee yard intruders? Certainly, many factors combine to shape the nature of a bee yard. Researchers at Newcastle University in England are studying the emotions of honey bees. Using a series of carefully designed tests, the researchers are finding evidence that honey bees react to hive disturbances in ways that were previously unexpected of invertebrate animals. The bees are trained to anticipate pleasant or unpleasant feedings, and then the researchers record how the bees react according to learned expectations. The honey bees in the study are given a pleasant reward of sugar or an unpleasant offering of bitter quinine. They respond by sticking their tongues out for a reward of sugar. However, some of the bees in the study are shaken in a manner similar to having their hive attacked by wild animals. Shaken bees change their behavior and become “pessimistic” according to the researchers’ descriptions. They react by not sticking their tongue out for an unknown offering of food. The shaken bees seem to be anticipating that an unknown feeding will be associated with punishment To read more about the study, see “The Secret Minds of Bees” at http://www.onearth.org/article/the-secret-minds-of-bees. We don’t know if honey bees experience human-like emotions, but we do know that the manner in which we handle bees goes a long way toward determining their behavior. I explained to an observer today that a little smoke settles bees; too much disturbs them. The bees teach us how much to use. In today’s photo, I’m surrounded by disturbed bees. A new beekeeper preparing for his first harvest asked me about handling the honey. He wanted to know how to tell if the moisture in the honey was correct and how to adjust it if it is too high. When the honey bees collect nectar from flowers, it is mostly water with a weak concentration of sugars. The bees start the conversion of nectar to honey as they carry it back to their hive inside their honey gut where it is mixed with enzymes. Once the nectar is deposited in the hive, worker bees continue its conversion to honey by continuously mixing it with enzymes. To concentrate the honey, the bees blow bubbles in the honey and stretch its surface area with their mouthparts. They evaporate the moisture from the honey by fanning their wings across its surface. They dry the honey until its moisture content reaches 18 percent. At this point, the bees cover the cells containing the now “ripe” honey with freshly secreted beeswax. I told the new beekeeper that ripe honey can be harvested and stored indefinitely. However, if honey is harvested too soon, it will have excessive moisture; and it may ferment. The safest way to prevent this is to wait until the frames of honey are at least 70 percent capped with beeswax before harvesting. At this point, the honey should contain the proper moisture for bottling or storing. Beekeepers typically measure the moisture content of honey using an optical device called a refractometer. I also explained to the new beekeeper that honey readily takes on or gives up moisture depending upon the environmental conditions. This occurs even with beeswax-capped honey in the frames before it is extracted. Beeswax is porous. In the honey house, honey can be further dried, as the bees do it, by blowing dry air across the honey’s surface. In today’s picture, bees fan their wings to dry and cool the exterior of the hive while others inside fan to evaporate honey. Honey bee colonies produce new queens as they need them through the spring, summer, and fall. The bees make new queens for supersedure, or replacement, of aging queens; or they make new queens to sustain the colony after it divides and swarms. Some races of bees, like the Russians, continue to produce numbers of queen cells throughout this time. The bees tear down the cells if a new queen is not needed in the hive at the time. 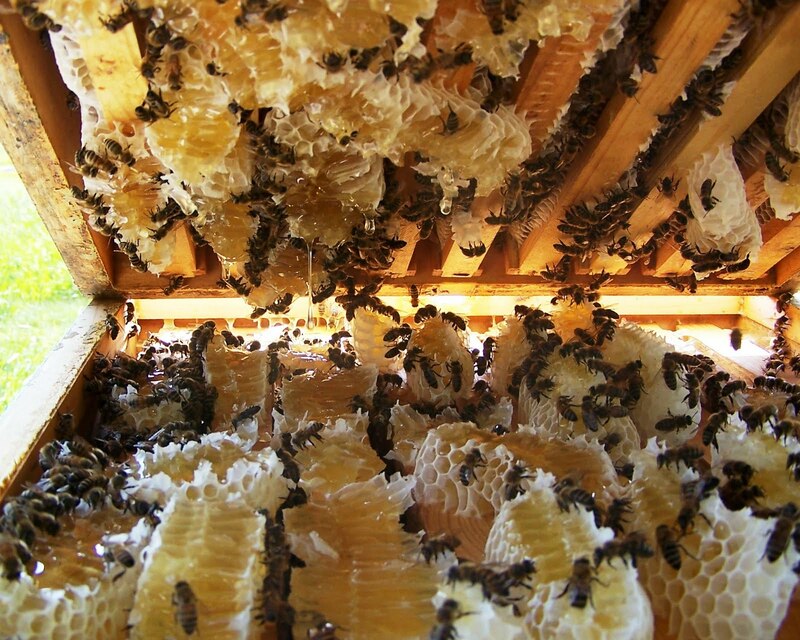 Beekeepers produce queens during the same period by encouraging the bees to produce queen cells. The queen cells may be created by either grafting day-old larvae into queen cell cups or by non-grafting techniques. Today’s photo shows beekeepers practicing grafting at a University of Arkansas Cooperative Extension Service advanced beekeeping workshop in Little Rock, Arkansas. In the Mid-South area, queens may be reared from May through August. An important element in the production of good queens is the availability of sufficient numbers of drones to mate with the new queens. If we attempt to produce queens too early in the spring, they are often of low quality because large numbers of sexually-mature drones are not available. The number of drones in the drone concentration areas is often reduced late in the summer, especially during times of dearth of nectar and pollen. At this time, the colonies produce fewer drones and sometimes remove drones from the hives. Late-season queens that are well mated with good drones make for prolific colonies for pollination service or honey production the following year. At Peace Bee Farm, we like to produce a number of extra queens to have as replacements for lost queens. If we detect a queen-less colony during a nectar flow, we can easily replace her by bringing in a laying queen housed in a nucleus hive. Once the two hives are combined using a sheet of newspaper to slow the merger of the bees, the colony can continue producing honey without losing population.